Are the tutors professional mediators? Yes, all tutors are working as professional mediators. Yes. You can make five monthly payments. It costs 20% more. You can find the cost of paying by instalments by clicking here. There have two types of people you can contact - your tutor and a course advisor. The tutor marks your work, and helps you with any problems. You can fax, email or post assignments to your tutor, whenever you want. But sometimes students get stuck, or have an urgent question. If so, you can phone a course advisor at the Blackford Centre at any time during work hours. If you leave a message out of work hours we'll call you back the next day. You can contact course advisors as often as you want. No. But it will help you get work as a mediator or set up your own mediation practice. And we encourage all students to continue their studies after completing the course. Can I become a family mediator with this course? To become a mediator in the UK family courts, you need to have successfully completed a course recognised by the Family Mediation Council (www.familymediationcouncil.org.uk). We have not currently applied for recognition. 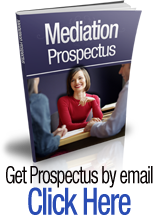 However, if you’re starting out in mediation, this course is a good place to begin. It will give you an introduction to family mediation as well as all the other types of dispute resolution. Remember that much family mediation occurs outside the courts. How does this course compare with a 2- or 5-day classroom course? Interaction: A classroom-type course allows for live interaction between students, which is invaluable. However, the costs and the fees of a live environment are therefore higher. We provide a Buddy system that allows you to practise mediation with other students. Length: In our experience, a 2- or 5-day course isn’t long enough to give you sufficient depth of knowledge. Our learners typically take five months to complete the course, and we know that the questions they ask after five months are quite different from those they pose in the first five days. If you look at the link called ‘What does the Course Cover?’ to the left of this FAQ page, you’ll see the wide range of topics that we believe can’t be covered adequately in five days. Ease of understanding: A classroom course is easier to do than a distance learning course, because it’s a dedicated time and space, with no distractions. Also, you mostly just sit and listen, and then do some practise with another student. With home-study, you must be sufficiently self-disciplined to complete your assignments over the length of the course. That means it isn’t for everyone. Flexibility: Home-study allows you to learn at times and place that suit your personal needs, not those of the course providers. And because there’s no time limit, you can take as long as you want to complete the course. Your own experience: Someone with no experience of negotiation, mediation or the law will probably find a classroom course an easier option. Anyone who has seen mediation in practice, or who has negotiated in a work or family environment may find that home-study offers a more detailed and ultimately more rewarding experience. Employment: The Blackford Centre’s course aims to help you get employment (or self-employment) in mediation. It’s an important focus that other courses don’t always have. As part of this goal, we provide three months’ free business mentoring when you complete the course. Summary: We believe that home-study offers better value for money and flexibility. But it won’t suit everyone.